I always enjoy the food. It is fresh and super healthy... and is plated nicely and in a colorful manner. Your menu has a good variety of healthy and delicious items to enjoy. I am 66 yrs. old and am trying to eat a healthy diet... so I always enjoy coming in to try something new. The staff were so supportive. We brought a noisy toddler and they gave us area where she could run around. Healthy, amazing, classy food! Even the toddler loved it! My overall experience at the Fresh Queen St. West location was overall outstanding.The food was amazing. I reccomend having the quinoa onion rings with your choice of dipping sauce and the clubhouse wrap. Their smoothies are also fresh and delicious. I was also impressed at the service, with our server being accomodating and extremely friendly. Fresh on Crawford is a regular favourite of ours. The service is always great. The food comes out quickly . Highly recommended! I love fresh and have gone to all the locations through out toronto many times, but this time was my first time eating in at the one on crawford. I understand that it was vday, but we waited 40 min for our food and the server did not come in and let us know it was running late or check in once. We also noted the date as a birthday and there was no acknowledgement of that. Love the restaurant but wouldn’t recommend this location. The restaurant itself is lovely. The cocktail I ordered was delicious. I was a bit disappointed in the food this particular evening. The food was cold, including the fries. On other occasions food has been better. We went for brunch. The tofu scramble was tasty, but salty. Then home fries were a disappointment. They had no seasoning and appeared to have been made with frozen home fries. The bread/toast was nice, but it was dry and we had to ask for jam. The service at other tables seemed okay, but our server was not attentive. It was nothing special. I prefer the other locations. The staff weren't very friendly and the food wasn't that amazing. Love going to Fresh with friends. The burgers and smoothies are fantastic. Pretty much everything is tasty on the menu. Highly recommended. Pretty long wait times considering no one was really there. A lot of tables were empty - which was kind of a bummer since it was Saturday evening. Server was nice but main food items seemed to take too long. I wouldn't blame our server for that though. They were good! I always like the food at Fresh and the quality was as expected. But that wait on the patio wasn't really great. I might come back to this location, but others seem better from past experience. Fresh on Crawford is always my number one choice when it comes to special evenings out. The food is so tasty and so creative that I can't think of another restaurant that comes close to this. Sitting on the patio is lovely but a bit noisier this time. My only problem is choosing and entree out of the many Fantastic items on the menu. Fresh never disappoints which is why it is one of my all-time favourite restaurants. The menu has a variety of delicious, healthy options to choose from and they even have a separate menu that highlights the gluten-free options for my celiac friends. I especially love this location for the patio - covered and heated in winter and open in summer. Despite the delicious entrees, make sure you save room for a Bunners donut for dessert! Quiet birthday dinner at Fresh on Crawford with my wife and daughter. Open Table reservation gave us a well located table on the patio with a view of the sidewalk action on a warm summer evening. Wide array of flavourful menu options from drinks to dessert made for a memorable evening. I recently visited Fresh on Crawford since a friend had recommended it to me and I was very impressed by both the service (our waitress was exceptional) as well as the food. 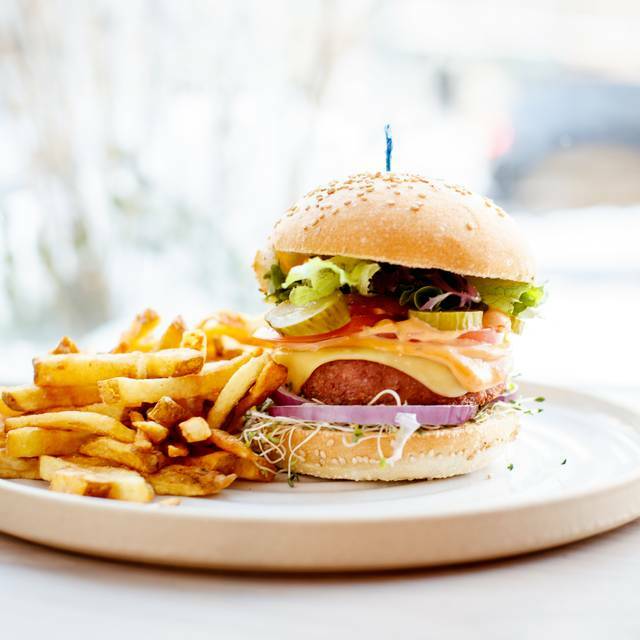 Their menu featured many vegan classics as well as a vegan spin on popular foods such as poutine, burgers, tacos, etc. My family ordered the cornbread and green poutine to share for apps and we adored the green poutine! The mushroom gravy was outstanding and the "cheese" taste amazing (which is not always the case with vegan cheese). Our main meals were also delicious as well as dessert, lattes, and milkshakes. I would recommend this spot to everyone - 10/10! We are not vegetarians but were pleasantly surprised over how satisfying the food was despite being entirely plant based. The tacos were flavorful albeit difficult to eat because they were so overstuffed. The onion ring appetizer was very good (and the rings were HUGE--could have worn them as bracelets! ), as was the garlic dressing on the side. Our main complaint is that occasionally we would smell a sewer smell wafting over the patio from the street. Not the restaurant's fault, but it did affect our dining experience. Nevertheless, I would still recommend this restaurant, but perhaps try to attend on "favorable wind days" or with indoor seating! I chose the Crawford location because it has the patio. The acoustics on the inside of the Fresh restaurants aren't good and could easily be improved. The restaurants are incredibly loud. I love the food though, so when I go to Fresh, I go to Fresh on Crawford for the outdoor patio. Wonderful location, fresh, delicious food, with a wide variety of options. Service was excellent. Seating was very cramped on patio and table was so far from exterior, that we felt we were inside. Still the food is incredible! The food was great, however the service was terrible. We received a very dirty glass and without noticing poured some beer into it and then when we were finally able to ask for a clean glass we got one but no new beer to make up for the one poured into the dirty glass. We were given no napkins and had to ask a few times for them and we waiting about 20 mins for our bill. This restaurant is great but your staff really need to be trained on customer service. Great patio. Food is always good.